Spanish, the language of Latin heat, the language of tropical passion, the language of high school graduation requirements everywhere. But is Spanish really the language that you should be learning? Why not try learning something different, something exciting, something that will give you more skills Linguistically. No, we’re not talking about French, or Polish, or even German (why would anyone want to torture themselves with German being the first language they ever attempted; Why?). 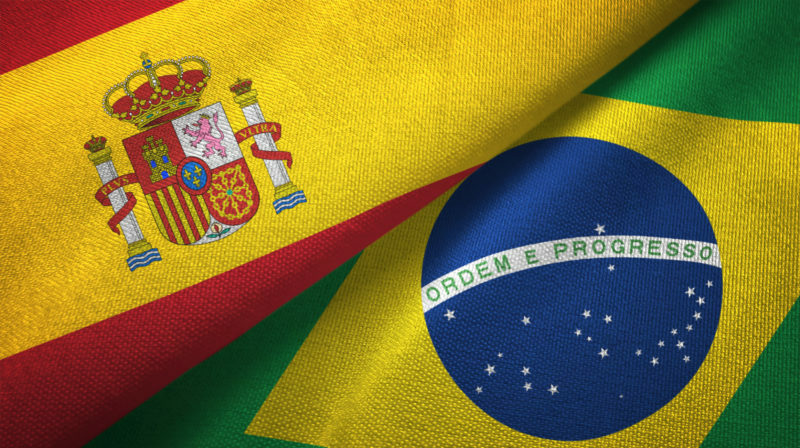 We’re talking about the closely related and more sophisticated cousin of Spanish, Portuguese! But why learn Portuguese instead of Spanish? Believe it or not Portuguese is spoken in more places around the world than common Spanish is. Portuguese is spoken by more than 210 million people around the world on an active basis. This places Portuguese among the top 10 languages in the world. While it’s true that in Portugal itself and around Europe there are only 10 million approximate Portuguese speakers, but with the language is in full use in more than 40 other countries around the world. When you choose to learn Portuguese instead of Spanish you are opening up a significantly greater number of doors both personally and professionally. Many major cities around the world have vibrant and active Portuguese speaking communities. London, for example, has one of the largest, as does San Francisco, New York, Miami, Athens, and Sydney. When you travel to these cities and others like them, you will be able to enjoy hidden treasures and out of the way enclaves that give you the opportunity to have experiences the likes of which you won’t find anywhere else. Brazil! Is There Any Better Reason Than That? Fantastic music, amazing art, and the worlds best clothing optional and traditional beaches all await you in the Latin paradise known as Rio, and that’s only the beginning of the adventures and history that you can explore throughout one of the most visited and beloved countries on the planet. The official language of Brazil is Portuguese, and knowing how to speak it gives you an inside track to all of the best that country has to offer. Brazil is a hotbed of culture, art, style, music, literature, food, and more. Portugal, not so much. We all know that Portugal was once a powerhouse in European culture, but as the old adage asks, “what have you done lately?” while there is always the historically significant contribution that Portugal has had to the world, today no one is interested unless they are scholars or history buffs. As an added note, the disparage between South American Portuguese and European Portuguese is not nearly as wide as the difference between European Spanish and North/South American Spanish so once you learn the Brazilian version of Portuguese picking up the European slant is super easy, and then you can enjoy the best of both worlds. Throughout the world, there is a highly unified Portuguese speaking extended culture known as the Lusofonian Sphere. These seemingly independent groups all share a common historical and cultural base that unifies them despite their distances and local customs. Very few other linguistic groups have been able to develop such a global common connection. When you learn to speak Portuguese you are placing yourself inside this sphere and that opens up the possibility of you being exposed to some of the most incredible cultures on the planet, no matter where on the planet you are. Often referred to as the Slavic of the Atlantic, European Portuguese shares a lot of the same Phonological bases as many of the romance languages. While Brazilian Portuguese does not have as many of these base connections, you can still see their influences. If you are one who loves languages, and is fascinated by phonological constructions then Portuguese is the language you have been yearning to learn. The fascinating constructions, the evolving sound patterns, and the complex diatoms make it one of the most intriguing and beautiful languages to learn. Portuguese is a language that is rich with literary tradition, but the truth is, not many people are aware of this since the language is not commonly practiced outside of the Lusofonian Sphere. If you are a true to the heart lover of literature, then you should be an adopter of the Portuguese language. This opens up a whole new realm of possibilities for you to explore. Just think of all the hidden Portuguese literature treasures just quietly sitting in dusty dark corners of libraries and archives just waiting for you to discover them and fall in love with them. Just as Portuguese literature is filled with hidden treasures and lesser-known classics, so is the world of Portuguese music. In every musical genre, there are Portuguese artists, composers, songwriters, and more that are just waiting for you to discover them and take them into your heart. If you are a true lover of world music, then you should start to explore Portuguese music and the best way to truly appreciate it is to understand the language behind it. Learning to Run Before You Can Walk Makes Walking Easier? We have all heard that you shouldn’t try to run before you learn to walk, but in this case, that may not be true. Portuguese is a highly complex language that developed out of the combination of several of the base romance languages. This makes it the ideal language to learn first if you are wanting to learn other languages such as Spanish, Italian, Romanian, French, etc. Mastering this more complex language puts you in possession of advanced skills that make learning languages that are less complex easier by comparison. Ok and to possibly show off in the Basque Country and Catalunya. Portuguese speakers are more than surprised and pleased when you show that you have learned their language, they have an intense respect for you. Of course, there is also a bit of pride that comes from being able to say that you are a speaker of an uncommon language that is far superior linguistically to what your peers speak. If you are looking for a language that sets you apart from the crowd, then Portuguese is it! With these concepts in mind in its easy to see the answer to the question why learn Portuguese instead of Spanish. That’s not to say that you shouldn’t also learn Spanish once you have mastered Portuguese, but going with the harder of the two first will make learning Spanish and indeed the other romance languages such as French or even Romanian easier despite their massive differences. It also will give you a sense of personal accomplishment, and ok a little well deserved cocky attitude, that you mastered a language that is so difficult to grasp by non-English speakers. So go ahead and take on the challenge of Portuguese and bask in your well-deserved accolades when you become a fluent speaker of one of the worlds most beautiful languages.